Beautiful villa comprised of a main house and a garden house (taken together) set in a sizable, naturally terraced garden with a large private swimming pool and panoramic views of the countryside. Set on the edge of the small medieval hamlet of Palazzuolo to the north of Mont San Savino within half an hours drive (normally) of Florence and Siena. Shops 10km. A restaurant at Palazzuola 2km. Riding 7km, tennis 10km and golf 26km. 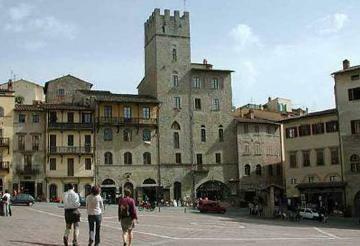 Arezzo 21km, Cortona 29km, Siena 43km and Florence 84km. Pisa airport 165km. The upper floor (accessible via interior and exterior stairs) has a living room with fireplace and a double sofa bed. Double bedroom (1 x 140cm wide bed), further double bedroom (1 x 140cm wide bed) with shower room, twin bedroom (2 x 90cm wide beds) with shower room. Bathroom. The ground floor has a kitchen with fireplace, living and dining room with access to an arched covered terrace. Twin bedroom (2 x 90cm wide beds) and a bathroom (small bath). Heated by a wood burner. Palazzolo Alto is furnished and equipped to a high standard. The garden is superb, with is a beautiful pool, lawned areas and mature pines offering shade. Property made available in good order and fully equipped. Local taxes (unless specified otherwise in the villa description), reasonable consumption of services including water, gas and electricity. Linen and towels (not beach towels) provided. Garden and swimming pool maintenance. Saturday arrival 15.00 to 19.00, depart before 10.00. Pool open from 07/05 to 24/09/16.